Electroscapes comprises an installation and series of experimental images generated from a modified digital processes that incorporates surveillance software and locative media. The works meld “datascapes” with natural scenery, and they reinterpret landscape by rendering visible the flow of electromagnetic frequencies that moves within, and around, remote geographic environments. How the ubiquitous yet invisible wireless activity in our culture expresses itself aesthetically and artistically on/in nature are the thematic cornerstones of Electroscapes. The images in Electroscapes were created through a multistep process. 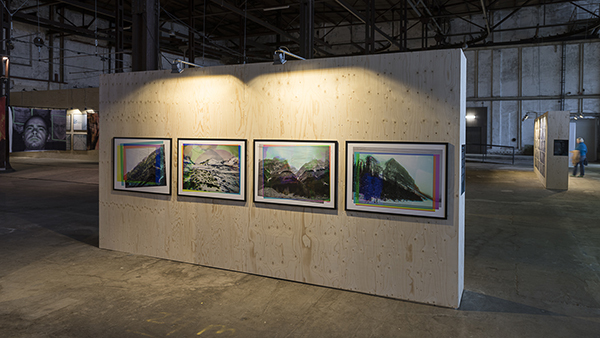 The artist photographed the Columbia Ice Fields in the Canadian Rockies (the largest ice mass in the Canadian Rockies that is in continuous motion and slowly receding), through a series of coloured gels, at the same time as he monitored and recorded radio-frequency radiation circulating around the landscape. The artist used FBI packet-sniffing surveillance software and an electro-smog meter to record IP tracking addresses, threshold readings and GPS data emitted from tourists wireless devices. That data was then altered through a programming language to create cartographic linear drawings, they were then combined with the actual tri-colour photographs exposed during the data-gathering process. The frequency of the data collected, the variable, random and erratic use of wireless devices around these majestic landscapes, then affected the image-making process and shaped, in part, the aesthetic outcome of the works. A permutation of abstract digital foreground, and the scenic background, the multi-media installation works in Electroscapes questions the conceptual basis of how we perceive the “natural” world around us. The artist gratefully acknowledges the assistance of the Ontario Arts Council.